An Osun based Community Development Organization, Araromi New Era Support Initiative, has felicitated with Alhaji Isiaka Adegboyega Oyetola on his emergence as the flagbearer of the Osun State All Progressives Congress in the September 22 gubernatorial election in the state. The group, with thousands of members across all the local government areas of the state, sent their regards to Oyetola through a communiqué released on Thursday 26th July, 2018 after the meeting of the State Working Committee of the group in Osogbo. Explaining why the group decided to throw their weight behind the Chief of Staff, its State Acting Coordinator, Mr. Basiru Abiola Olaposi said there are issues of common interest that it shares in common with the APC administration. These areas of common interests according to Olaposi included security of lives and property, agricultural enterprise, youth empowerment, human capacity development and helping the less privileged. coordinator, said the performance of the administration Ogbeni Rauf Aregbesola across all the nook and crannies of the State and the huge investment the APC administration committed to the welfare of the people of the State was also responsible for the NGO's support for Oyetola. 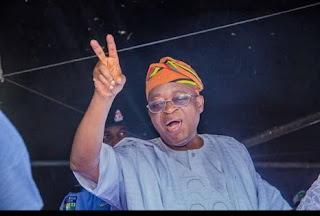 According to him, "we believe that Alhaji Isiaka Adegboyega Oyetola is eminently qualified not only to sustain the good legacy of the outgoing administration but also will continually build on it for the betterment of the State of Osun and its people. It is on this basis that we have resolved among ourselves and members to throw our weight behind his candidature." "Araromi New Era Support Initiative Solidarity is a humanitarian organization that has been empowering the people of Osun through provision of critical needs for its teeming members and facilitating different empowerment and skills acquisition programmes in order to ensure that they are self reliant. "We however thank our founder and motivator, Alhaji and Alhaja Fatai Adesina Kolawole for their commitment to people's welfare and emancipation without discrimination," the group said. Other officials and leaders of the group who were with the State Acting Coordinator while reading the communiqué are Barrister Taiwo Adedoyin, Adewale Babatunde, Adegoke Adeleye, Kolapo Michael Bolarinwa, Mr. Agbenuobe a.k.a LEGACY, and Mr. Wale Ogundoyin among many others.